The secret to tasty BBQ leeks is to blanch the leeks first so that they’re pretty much cooked before they go on the BBQ, then dress them in a tangy vinaigrette that compliments the sweetness of the leek. Almost any mustardy vinaigrette will do – I keep it basic with olive oil, white wine vinegar and dijon, then add fresh herbs like parsley, chervil or oregano to vary the recipes. 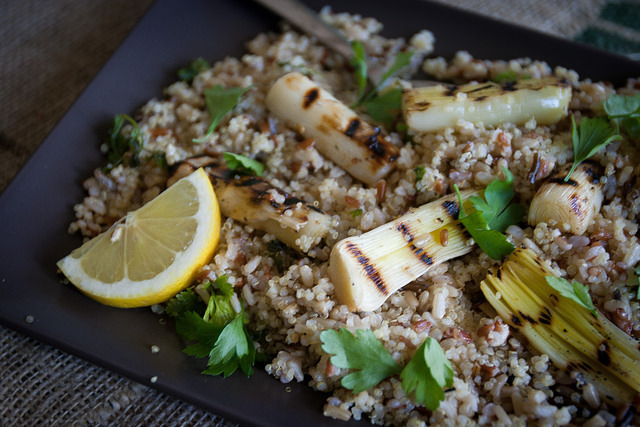 Serve the leeks over some whole grains like barley, quinoa or wild rice and you have a substantial side dish that’s perfect for a BBQ. You can also add other grilled vegetables – courgettes and asparagus work especially well. Too cold for an outside BBQ? Stay inside and cook this on a griddle pan. 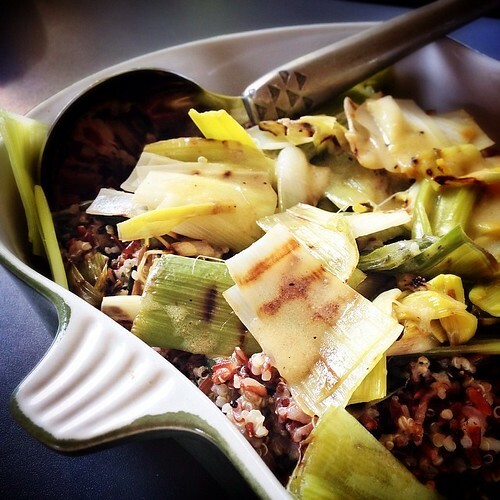 Inspired by Riverford’s Griddled Leeks with Wild Rice, Quinoa and Chervil. Boil the leeks for about 8 minutes, until tender. Remove from the boiling water and run under cold water until cool. Slice each piece in half lengthwise. Meanwhile, make the vinaigrette by whisking all of the vinaigrette ingredients together in a bowl. Drizzle olive oil over the leeks and use your hand to slather the oil all over the leeks. Season with salt and pepper. Heat up the BBQ (or griddle pan) on a high heat. Grill the leeks on each side to make ridge marks. Toss the salad leaves or grains with some of the vinaigrette and most of the fresh herbs. Arrange on a plate and top with the grilled leeks. Drizzle the rest of the vinaigrette over the leeks and sprinkle with the remaining herbs. Also seen on Great British Chefs.